Does your first name have a special meaning or was it given to you as a memorial to one of your ancestors? Do you want to know the meaning of your first name? As we search out our ancestors, it's natural that our interest will go beyond the basic of, "Who's related to whom?" and into questions about where our family names come from and what they mean. 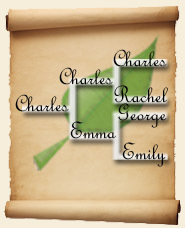 MyTrees.com patrons often write to ask about the origin and meanings of the names of their ancestors including first name and also about the heraldry of surnames. I will be addressing some of those questions in this three part series on names. We'll begin with first names. How are first names chosen and what do they mean? Where do our first names come from? Usually parents put quite an effort into choosing a name for a child; more than just picking a first name that sounds good. In fact naming stories are a fun part of our personal and family history. Perhaps because our first names are such an intimate part of who we are, telling those stories allows us to share a little of ourselves with others. For example, my first name came from a song, Aubrey, sang by the 1970's rock band, Bread. My mother used to play the song to me on her guitar when I was little, making it part of a treasured childhood memory. The way first names are chosen has always held special meaning in cultures around the world. Religion often plays a big part in naming traditions. In America many of the popular names actually have religious roots. According to the Social Security Administration, the top five male names in 2008 were Jacob, Michael, Ethan, Joshua, and Daniel-all Hebrew names used in the Bible. In the Catholic and Orthodox religions there is a tradition of naming children after saints, using the calendar of saints, which associates each day with one or more saints. Babies would be given the name of a saint whose feast day was on or near the day on which they were born or baptized. In some cultures, the name day-the feast day of the saint you were named for-was celebrated more than, or instead of, the birthday. Some Orthodox Jews believe that there is only a limited amount of life in each name and therefore named children after deceased relatives. They believed that giving a baby the same name as a living relative may shorten the life of that relative. In Russia, the tradition is to give children a patronymic middle name, or one that is based on their father's name. For sons, the middle name is the father's name with a -ich ending and for daughters it is the father's name with a -na ending. So, a man whose name is Nikita would give his son the middle name of Nikitich and his daughter Nikitichna. And, of course, there are many other ways to choose a name. Many Native American tribes hold the custom of naming a baby after something in nature like Little-Flower, Dawn, or Sitting-Bull. Japanese baby girls are often named for virtues or seasons of the year. And sometimes parents really do just pick a first name that sounds good with the last name of the family. Are there Laws that regulate what you can or can not name a child? It's true. Even today, some countries have laws about what you are allowed to name a child. You may have heard about the New Zealand couple who tried to name their son 4Real back in 2007. When they attempted to register the name, they were told that a name could not begin with a number. They eventually named their baby Superman instead. New Zealand has also disallowed the names Satan and Adolph Hitler in the past. French parents were only given complete freedom to name their children anything they liked in 1993. Before that, various restrictions had limited them. In 1539 a decree made it so that a baby's name had to be approved by a priest and registered, basically limiting name possibilities to those of saints. Napoleon's decree in 1803 was somewhat more liberal, allowing the names of well known historical figures as well as saints' names. Charles de Gaulle widened the approved list to include some mythological, regional, and foreign names. Although, also outlawed were some names that were considered to be ridiculous or laughable. In 1933 Hitler decreed that German children had to be given German names. Today, children's names must be approved by government authorities. A book, the International Handbook of Forenames, contains a list of approved names and is used as a guide to help German parents pick out names. On Portugal's Justice of Ministry website you can download a .pdf file that contains a list of approved and not approved names to give your child. Darci is allowed, but Darcy is not. In Spain first names are chosen by the parents and must first be registered at the Civil Registry. In the past it was customary for Catholics to have their children baptized and at that time have the baby named by the priest, but this custom is not generally practiced anymore. 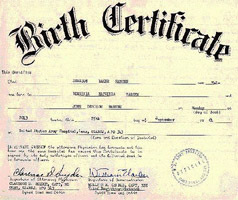 Hispanic parents can generally choose any first name they wish, with few restrictions. Often a first name is chosen to honor a living or dead relative. The most common source of first names are the names of Catholic Saints and the traditional Spanish names, especially María and José. The first name "María" is usually a girl's name in honor of the Virgin Mary, but can be part of the name of a male if prefixed by a masculine name: for example, José María Aznar. Conversely, a girl can be named "María José" or "Marijose" after Joseph, husband of the Virgin Mary. What's the meaning of your first name? 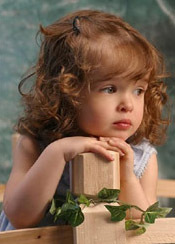 Another aspect that often plays a big role in picking a first name for a child is its meaning. Sometimes parents choose a first name based on a characteristic they want that child to have. The Puritans tended to do this, giving their children first names such as Charity, Faith, Grace, Honour, or Thankful. The Puritans also sometimes made use of longer, hyphenated first names to get the point across. Some examples are Zeal-for-the-Lord and Learn-wisdom. What a name means can be important and can influence how a child is treated by other people. Not to mention that it's just plain interesting to know what your own first name means. My first name is Germanic and means something like ruler of the elves, which is quite fun to tell people. There are a number of places including books and websites where you can look to find meanings of first names. There are a few suggestions of sites to visit and books to read at the end of this article. One of the challenges of genealogy research is trying to find an ancestor when their first name or last name isn't spelled the same way in each genealogy record. There can be any number of reasons for the differences in the spellings. One is simply that care with spelling is a relatively modern idea. Up until the last few hundred years, people spelled phonetically, meaning that a first name or last name could be spelled differently depending on who was writing it. There are also errors in transcription to consider and of course abbreviating the name. Chances are, your ancestor's name has been copied down in numerously different ways over the years. It's important to be aware of that and to try different spellings when you are searching any genealogy resource. Here are some suggestions to keep in mind when searching in MyTrees.com. Enter only part of the first name in the first name field and the search will display all first names that begin with those letters. So if you enter Jo into the first name field, you would get results for John, Joseph, Joan, etc. This can be very useful when an ancestor had a name such as William that could be shortened a number of ways. Doing a search for Will, would produce results for Will, Willie, Willy, and William. Entering Sall would give you results for Sally or Sallie. Make use of this searching capability when you have a name that could be spelled or shortened in multiple ways. If your ancestor had a unique last name, you could also try searching with "Unknown" in the first name field. That will bring up results from files where the first name of an individual was not known, but their surname was. You can limit the number of results you get by shortening the date range. Try searching on just a few years around major life events, such as birth, marriage, and death. Another thing to try is a search leaving out the first name altogether. Just leave that field blank. Again, this will probably only be effective if your ancestor had a unique last name. Doing a search on the last name Smith with no first name would return way too many results to be helpful. You can also limit results with a smaller date range. If you find that you are still getting too many results, you may want to further limit the results by searching on only one volume of family histories at a time. You'll see the "Database Volume" option on the search page, just above the search button. You can search by year of volume (that's the year the information was added to our database). You can also choose to search in only our Extracted volume, which contains vital records that have been extracted here in our office, or our Internet volume, which contains links to various genealogy websites. MyTrees.com's Surname Browse feature can help you determine which surnames are available in MyTrees.com. There's a lot more to first names than it might seem. If you've enjoyed this article, keep an eye out for part two, where we'll talk about surnames, also called last names, their origins and meanings and the heraldry of a name. If you're interested in reading more about first names, check out the links I've included under References. A Dictionary of First Names, by Patrick Hanks, Hardcastle Kate, and Flavia Hodges. The Name Book: Over 10,000 Names-Their Meanings, Origins, and Spiritual Significance, by Dorothy Astoria.